Due to a scheduling glitch, CJ Chenier & The Red Hot Louisiana Band will now be performing along with Tom Chapin on Saturday, March 9. Chenier has appeared on the Jon Stewart Show, CNN and was featured on VH1 and Entertainment Weekly; and has been invited to perform at many large festivals, such as the New Orleans Jazz & Heritage Festival, Chicago Blues Festival and Austin’s SxSW Music Conference. 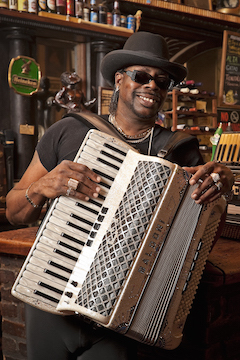 In addition to a Grammy nomination in the Best Regional Roots Music Album category, CJ has received many major awards inclusive of the Living Blues Critics' Poll Award, Indie Award (from AFIM) for Best Zydeco Album, Coups de Coeur (Blows of Heart) Blues Category Award from l'Académie Charles Cros (France) and Offbeat Magazine's Best Of The Beat, Best Zydeco Album.